What can you do with a pizza dough? Throwing up the pizza dough and making it swirl isn't new. Not just pizza dough, but our parota masters have been doing this forever. 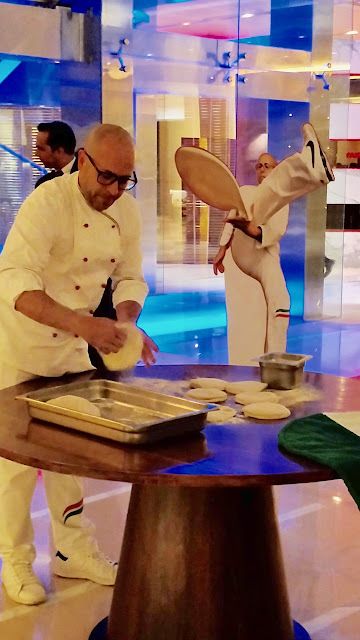 So Barbasso, a dough twirling chef arriving all the way from Italy to twirl it in Focaccia at Hyatt Regency Chennai wasn't very exciting. Until I saw a video of him, that is. Suddenly, it wasn't 'not such a big deal' anymore. It WAS A REALLY BIG DEAL. And since this is almost a SEE-IT-TO-BELIEVE-IT types, I'm posting a video below. Till the 10th of the month, everyday at 730 PM, there is a show and depending on how busy the restaurant gets, there might be another at 830 and 930, but to get the best glimpse, get your backside to the Hyatt lobby at 730 sharp. Follow it up with his pizza creations at Focaccia. 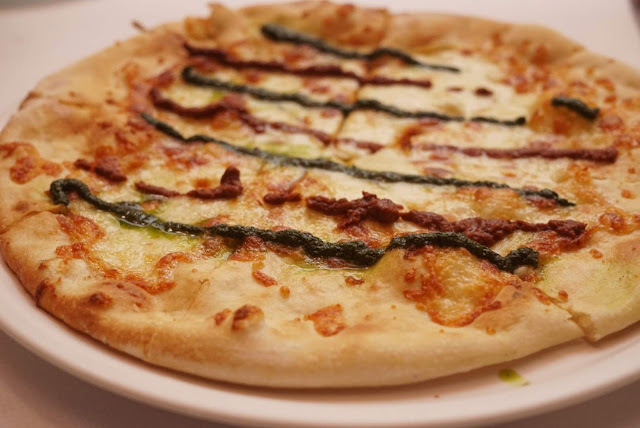 You don't mess with a Margherita, but since he did, he did the wise thing by calling it the Wrong Margherita! Loaded with cheese, but just a string of tomato and basil sauces. Ummmm, I'd like the correct Margherita please, thank you. When he is not messing with classics, they take a bold turn. 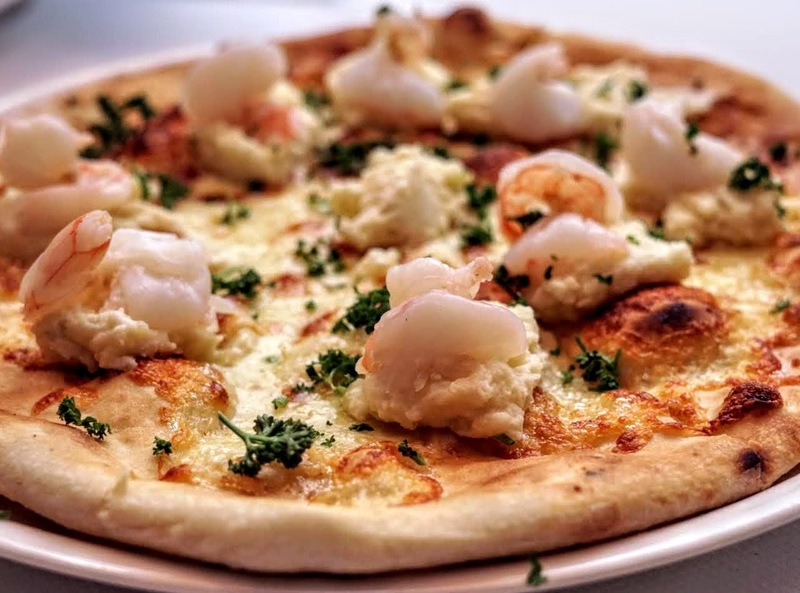 A mashed potato with king prawn pizza is an experiment done right. With every slice getting a chunky prawn placed on a bed of mashed potatoes, no fighting for a pizza slice here! The almost sauceless truffles on cheese was an excellent pizza. 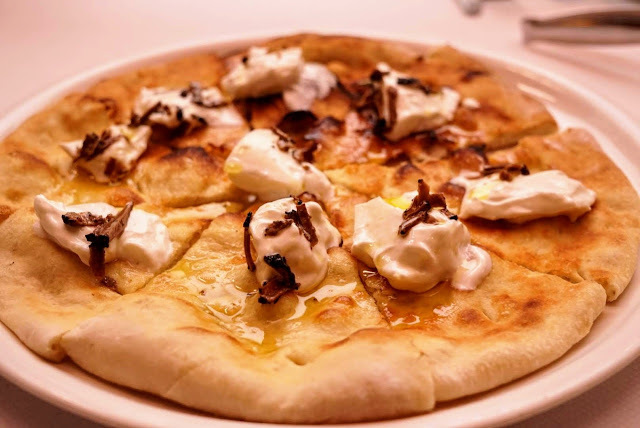 While it is difficult to imagine a sauceless pizza, the burrata cheese when slightly spread over more than makes up for it, with the small slices of truffle along with the truffle oil adding to the flavour. 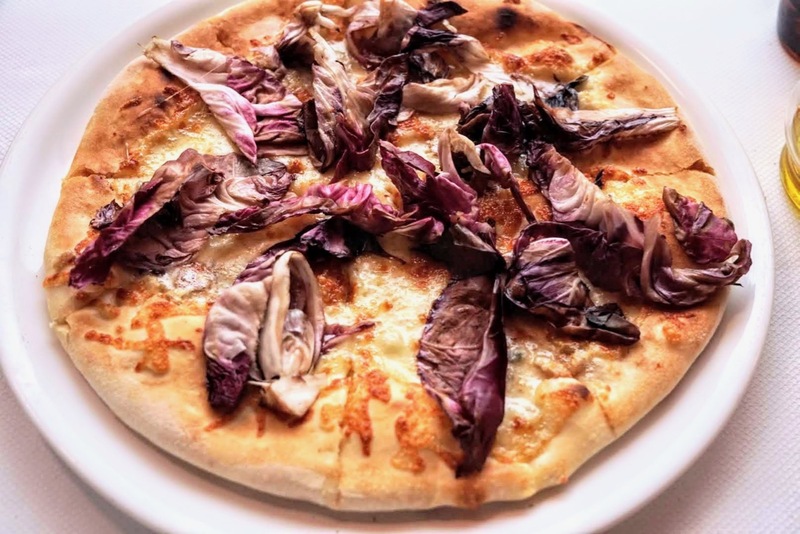 Bold get bolder with chicory on pizza. I've never had this before and I'm not sure if this is a rage in Italy either, but it was nice to see these experiments. After all, this is a pizza chef juggling three pizza dough and swirling them from under his legs, so what do you expect?! While chicory does add some colour to coffee, for me, a person who doesn't like espresso, the bitterness of the chicory didn't make the pizza any better. 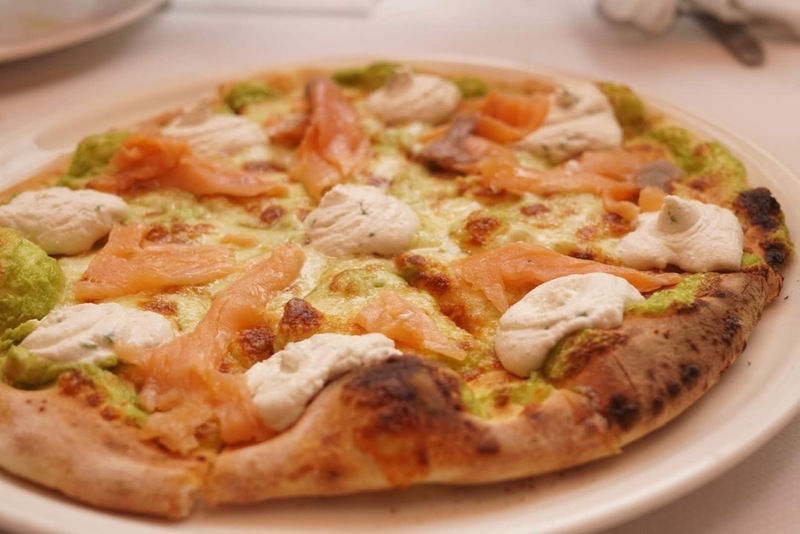 Then there is a the salmon pizza with generous, though lean, salmon and a Poly Pizza with loads of chicken to complete the list. On till the 10th, Barbasso's acrobats are a feast for the eyes which you can follow up with a range of pizzas priced at Rs 995 for 12 inches to complete the feast for the tastebuds. Chennai Foody: What can you do with a pizza dough?